Belgaum is in media coverage by the global media for the past year due to the young, very young skaters from town. Be it Rohan Konkane or this young lad Aniket Chindak who has got himself into the Ripley’s Believe It or Not book for ceating a world record for the longest limbo-skating feat by squeezing himself under a row of 82 Tata Sumo vehicles in just 53.02 seconds. Aniket trains four hours a day and was skating 60 miles a week in pursuit of the new challenge. Aniket’s record figures in the World Records Book of 2008 brought out by the World Records Academy of Romania and the Limca Book of Achievements of 2009. 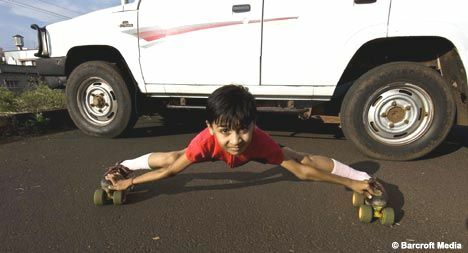 Aniket, studies in Precious Blossoms School, Belgaum had earlier managed to skate under 57 cars in 45 seconds. He has now bettered his feat. The star kid will go to the US next month for a felicitation function.